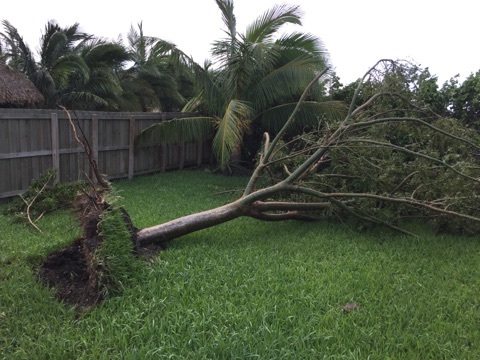 Among the devastation wrought by Hurricane Irma last week, many downed trees and uprooted plants were left in the storm’s wake. Those in a rush to get things back to normal have been quick to break out the chainsaws and remove the fallen debris in the days following the storm. But not all fallen trees and plants are lost causes, according to Christopher Baraloto, director of the International Center for Tropical Botany at The Kampong, a partnership between FIU and the National Tropical Botanical Garden. In many cases, plants can be put back in the ground and saved, including many downed trees. Step one is knowing what to try and restore. If the structure of the uprooted tree or plant is intact without major damage to the trunk, limbs or roots, it has a chance at recovery. Baraloto offers a few tips for saving those trees and plants that many may have thought are beyond saving. 1. Remove above-ground biomass. Remove broken or dead leaves, branches and limbs. However, now is not the time for routine pruning. 2. Cover exposed roots. Roots can dry out quickly. Covering them to make sure they maintain moisture is important. 3. Restore the plant to an upright position. Be careful not to damage the trunk or roots. This will help restore a strong structure. 4. Water, water, water. Water the plants as often as you would a newly planted tree. Root growth is important for recovery, so keeping the soil moist will help the roots grow.